Larutan by Drew Estate is a cigar all its own. As far as we know, no other manufacturer has attempted to blend a cigar with tobaccos from 12, count em, 12 countries, before Drew Estate created the Natural line. These babies are chock full of long leaves from (take a deep breath) Brazil, Cameroon, the Dominican Republic, Haiti, Honduras, Indonesia, Italy, Mexico, Nicaragua, Syria, Turkey, and several locales in the United States. This makes for a smoke with countless nuances, including chocolate, coffee, black pepper, red pepper, cream, cedar, oak, vanilla, and many others that you could swear is flavored, but the fact that its not is its very namesake (backwards). Top that off with the impeccable construction that made Drew Estate famous and you’ve got a complex stogie that will wow just about anybody, from the flavor-craving newbie to the seasoned aficionado. 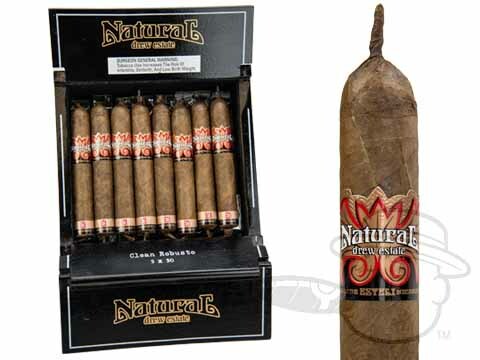 I have been smoking Natural Clean Robustos for 10 years and do not smoke any other brand because when I found Natural Clean Robusto I did not want any other brand. I get a lot of compliments from people who happen to get a whiff of my smoke and they all ask what brand of cigar I am smoking. Some who smoke cigars have switched to Natural products as a result. Larutan Clean Robusto By Drew Estate is rated 4.7 out of 5 based on 3 customer ratings.